Idaho Governor Butch Otter recently said some warming things about nuclear energy. Idaho Gov. C.L. “Butch” Otter said collaboration with the private sector is crucial to improving education in the state, and nuclear energy and advanced nuclear manufacturing will connect the state government, universities and the private sector. This makes sense. Despite not having any commercial nuclear facilities, the presence of the Idaho National Labs and the state’s history with the atom makes it a natural to encourage development. Otter said that nuclear power now accounts for about 20 percent of the energy produced in the U.S. And over the next 25 years, that demand will increase by 37 percent. Experts estimate that 360 new nuclear power plants will have to be built to meet the growing need, and Otter wants Idaho to take the lead. No governor is going to say no to new business, of course, and Idaho is well-positioned to tout its affinity for nuclear manufacturing. Regardless, it’s good to see Otter welcoming nuclear expansion in his state. The first nuclear reactor to produce electricity commercially was Pennsylvania’s Shippingport in 1957. The first one to generate electricity for domestic use was the Borax III reactor in Arco (current population: 995). It went online in 1955 and represented the first attempt to join nuclear energy to the grid, powering local homes and businesses. It was a test, of course, and not meant to be ongoing, but Arco’s brush with nuclear history has defined it ever since. What does that mean? 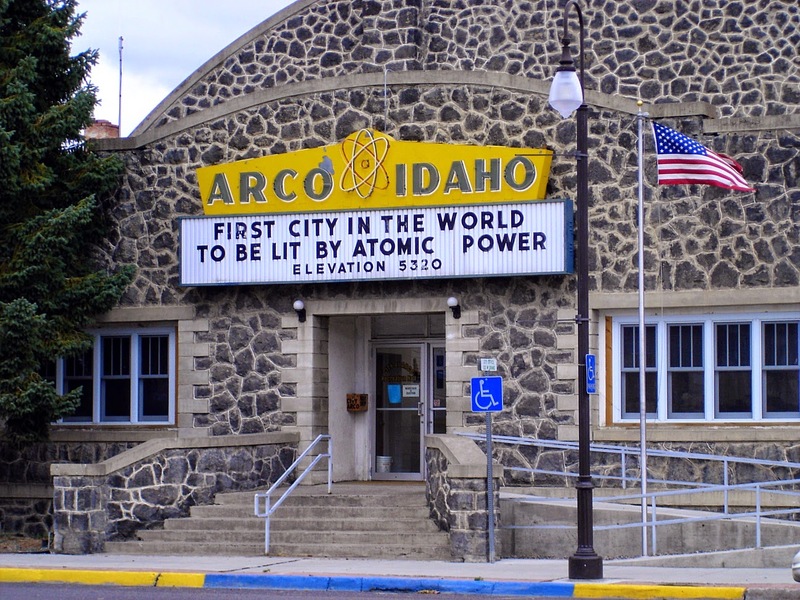 Well, for starters, should you happen to be in town July 16, you can attend Arco’s Atomic Days, which sounds to me like an old-fashioned county fair. I remember those growing up in Georgia, though with a heavier focus on 4-F activities. To be fair, The Atomic Days rodeo comes through on Friday. That should be fun. 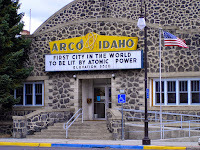 Located near Arco, Idaho, EBR-I Atomic Museum, a National Historic Landmark, recounts the history of the world's first electricity generating nuclear power plant and a successor project, EBR-II. An orientation video relies on interviews with EBR-I engineers and workers to place EBR-I in historic context. Exhibits describe how the facility was commissioned, built and operated and how EBR-I contributed to further developments related to the peaceful uses of nuclear energy. An exhibit in the EBR-II section provides a control panel for hands-on experience in running a nuclear power facility. Another exhibit discusses the geology of southern Idaho and attempts to explain why a nuclear reaction was build over a major aquifer in a volcanic region. Use the available brochure to take the self-guided tour, or sign up for a guide-led tour. Highly recommended. Free. Open Memorial Day through Labor Day. If time allows, a quick trip through nearby Atomic City might be interesting. This once bustling town is now almost a ghost town, but it shows traces of its past ties to the nuclear power industry. EBR is the Experimental Breeder Reactor, the predecessor to Borax III. It famously lit four light bulbs in 1951, the first generation of electricity by nuclear power. If you want to visit the nearby Idaho National Labs, you have to arrange things with them. They only hold tours for groups, so get up an atomic club and plan for a mid-July trip. That way, you can take in the rodeo, the EBR-I Atomic Museum and the labs. Arco might be dining out on its (admittedly significant) brush with nuclear history, but it’s a pretty hardy meal. Great timing on the mention of EBR-1 atomic historical museum, which is open 9am - 5pm daily from Memorial Day through Labor Day. There's a new social media focus on EBR-1, including a dedicated Facebook page and Instagram account. It's also located near Craters of the Moon National Monument, another great sight-seeing destination. Come visit & let us know what you think! "The first nuclear reactor to produce electricity commercially was Pennsylvania’s Shippingport in 1957. The first one to generate electricity for domestic use was the Borax III reactor in Arco (current population: 995). It went online in 1955..."
That's not correct. Maybe you meant to say that these were the first reactors to achieve those landmarks in the United States? Previous to this, the USSR generated nuclear electricity for domestic use in May 1954 from its graphite reactor in Obninsk, and the UK brought online its Calder-1 50 MW commercial nuclear power unit in 1956. Thanks, anon. I actually know this and should have been clearer I was talking about the U.S. Relevant to Arco being first, which is its claim to fame.